I'm supposed to be packing. Again. The better portion of last week I was at the Austin Film Festival, and tomorrow I head to the Poconos for Jenifer's autumn yoga retreat. I'm told that Odin himself will be present (pics to come! ), which is especially auspicious considering that I spent the past few weeks completing, refining, polishing the treatment for my Viking screenplay. In fact, I finished it just in time for the dash to Tom's mother's house, our traditional night-before-and-close-to-the-airport staging area. (Okay, so Yours Truly driving in the rain in the dark in New Jersey in a Prius is not, technically, a “dash.” We also stopped at Bertucci’s.) I’m pleased with the treatment and look forward to writing the next draft, but I’m also happy to pause for a few moments and catch my breath. Austin is a place where you can discuss the nuts and bolts of screenwriting with folks like John Milius and Terry Rossio. 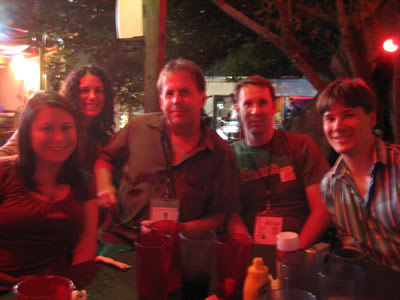 Austin is where you can see other writers and, more important, be seen as a writer. Austin is fertile ground, where a friend’s offhand comment at a party can instantly lodge in your mind and blossom into a premise for a high-concept comedy. Tom said he would attend the conference just for the plane ride home, when, inevitably, the backlog of promising concepts grows ever longer. Austin is also where friends new and old gather in the Driskill lounge to catch up on each other’s doings: Julie, a panelist this year, has a movie in post-production; Deb has a beautiful new book and promotional tour hitting stores this fall; and Brett is flying high as one of 10 finalists for the Nicholl Fellowships. You could do worse than this conference. Alas, the suitcase beckons. Soon tomorrow will rise, and Jenifer and I will celebrate our five-year anniversary. Wow- and then some loser's wedding the weekend after that! Who would've thunk that you'd be pulled so often out of your routine, to travel to distant lands and socialize with hoi polloi and elite alike? I know! The gall! Well, I suppose we'll just keep our yoga clothes packed. Good Lord, they're crawling out of the woodwork now! I'm going to start charging for autographs, m'kay?